ONE OWNER, CLEAN VEHICLE HISTORY, Bluetooth Hands Free, Balance of Factory Warranty, 4X4, JEEP FACTORY CERTIFIED, Alloy Wheels, Cherokee Latitude Plus, 4D Sport Utility, 2.4L I4, 9-Speed 948TE Automatic, 4WD, granite crystal metallic clearcoat, black Cloth, Quick Order Package 2BD. 2019 Jeep Cherokee Latitude Plus 4WD 9-Speed 948TE Automatic 2.4L I4 granite crystal metallic clearcoat Certified. FCA US Certified Pre-Owned Details:* Vehicle History* 125 Point Inspection* Transferable Warranty* Limited Warranty: 3 Month/3,000 Mile (whichever comes first) after new car warranty expires or from certified purchase date* Powertrain Limited Warranty: 84 Month/100,000 Mile (whichever comes first) from original in-service date* Roadside Assistance* Includes First Day Rental, Car Rental Allowance, and Trip Interruption Benefits* Warranty Deductible: $100Our Risk Free story includes: 1) 3 day or 150 mile money back guarantee. 2) 30 day or 1500 mile replacement guarantee. 3) We'll show you our 150 point inspection in writing, and signed by one of our factory certified technicians. 4) We've been in the Lehigh Valley since 1967, we'll be here tomorrow. 5) Live Market Pricing: To assure you of the best value for your dollar! KellyRisk Free,Lehigh Street South,Emmaus,PA 18049. 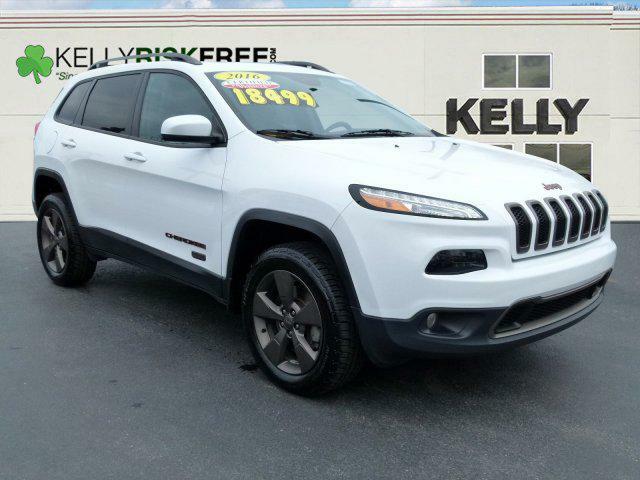 ONE OWNER, CLEAN VEHICLE HISTORY, Local Trade!, 4X4, Back Up Camera, JEEP FACTORY CERTIFIED, Alloy Wheels, Cherokee 75th Anniversary Edition, 4D Sport Utility, 3.2L V6, 9-Speed 948TE Automatic, 4WD, Bright White Clearcoat, Black Cloth, 1-Year SIRIUSXM Radio Service, 6 Month Trial (Registration Required), 75th Anniversary Badge, 75th Edition Cloth/Mesh Bucket Seats, 8.4 Touchscreen Display, 9 Amplified Speakers w/Subwoofer, All-Season Floor Mats, Blind Spot & Cross Path Detection, Bronze Fascia Applique, Bronze Grille Surrounds, Bronze Roof Rails, Cold Weather Group, Day Light Opening Moldings, Engine Block Heater, Exterior Mirrors Courtesy Lamps, Exterior Mirrors w/Heating Element, Exterior Mirrors w/Supplemental Signals, For More Info Call 800-643-2112, GPS Antenna Input, Heated Front Seats, Heated Steering Wheel, Integrated Voice Command w/Bluetooth, Jeep 75th Anniversary Package, Jeep Bronze Badging, Nav Capable! See Dealer For Details, No Satellite Coverage w/AK/HI, ParkSense Rear Park Assist System, Power 4-Way Driver Lumbar Adjust, Power 8-Way Driver Seat, Power Front/Fixed Rear Full Sunroof, Power Heated Mirrors, Power Multi-Function Fold Away Mirrors, Quick Order Package 27F 75th Anniversary (Retail), Radio: Uconnect 8.4, Remote USB Port, Safety/Convenience Group, SIRIUSXM Satellite Radio, Tangerine Interior Accents, Uconnect Access, Wheels: 18 x 7 Bronze Painted Aluminum, Windshield Wiper De-Icer. 2016 Jeep Cherokee 75th Anniversary Edition 4WD 9-Speed 948TE Automatic 3.2L V6 Bright White Clearcoat Certified. FCA US Certified Pre-Owned Details:* Limited Warranty: 3 Month/3,000 Mile (whichever comes first) after new car warranty expires or from certified purchase date* Transferable Warranty* Roadside Assistance* Powertrain Limited Warranty: 84 Month/100,000 Mile (whichever comes first) from original in-service date* Warranty Deductible: $100* 125 Point Inspection* Vehicle History* Includes First Day Rental, Car Rental Allowance, and Trip Interruption BenefitsRecent Arrival!Our Risk Free story includes: 1) 3 day or 150 mile money back guarantee. 2) 30 day or 1500 mile replacement guarantee. 3) We'll show you our 150 point inspection in writing, and signed by one of our factory certified technicians. 4) We've been in the Lehigh Valley since 1967, we'll be here tomorrow. 5) Live Market Pricing: To assure you of the best value for your dollar! KellyRisk Free,Lehigh Street South,Emmaus,PA 18049.